Mother’s Day this year will be something more than an ordinary day to honor motherhood this year for Tracey Diaz. To be sure, the 49-year-old Hamlet native will gather with her husband, Carlos, and sons Carlos, 19, and Matthew, 18, in their Marietta, Ga., home and be thankful they are together. But for Tracey, a 1983 Richmond Senior High School graduate, it comes down to this: She’s thankful to be alive. Diaz has long lived with the disorder. So too have her children, who have experienced non-cancerous tumors for years. But the tumors are cancerous less than 10 percent of the time. The tumors can be caused in part by hormones. When Diaz experienced a miscarriage nearly two and one-half years ago, her body was flooded with hormones. On came a tumor. Tracey and Carlos Diaz in their home in Marietta, Ga. The family did its research and banked on the odds. They lost. Diaz ended up having her left arm amputated on March 23. 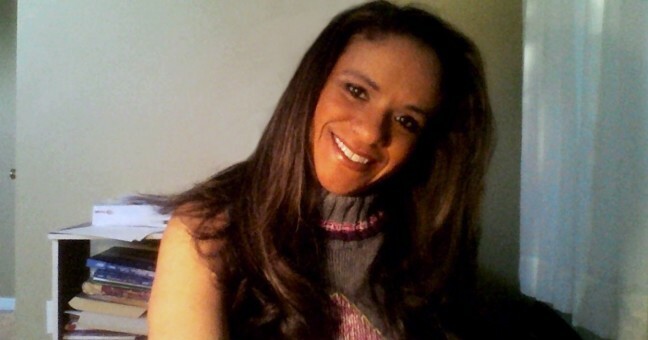 Diaz has been invited to share her story of faith, pain and perseverance on the Christian program Your World with Creflo.” The show will air on TBN at 9:30 p.m. on Sunday, May 10. Mother’s Day. “My husband and I did not think it was cancer,” Diaz said. The tumor was 20 centimeters. 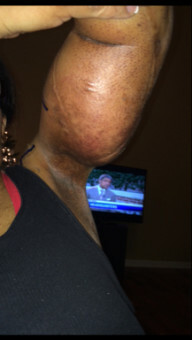 A geneticist and surgeon said the tumor could be excised but if a biopsy determined it was cancerous, her arm would have to be amputated. It was the first time the “a” word was mentioned. They did the biopsy. When she awoke in her hospital bed at Emory University Hospital in Atlanta, her husband was there. Diaz endured a 17-hour surgery — she has two scars from her knee to groin on both sides of her left leg, and one on her ankle, to prove it. The doctors removed veins and arteries to try and rebuild her arm. After a miscarraige about two and one-half years ago, neurofibromatosis helped caused Tracey’s body, flooded with hormones, to grow a tumor on her left arm. Part of the recovery process included a metal rod stuck into her bone that came about 10 inches out of her arm. She had to wear it at a roughly 80-degree angle for three weeks. While shopping at Costco, Diaz said she ran into someone who had to wear it like that for several years. Diaz took a lesson in that. “Oh God, please forgive me for complaining,” Diaz recalled saying. Not without difficulty, a spot on her arm finally healed in July 2014. She thought she was in the clear, but doctors wanted to be sure. They performed a CT scan. The results weren’t good. “Not only had the cancer come back, it spread to my lungs,” Diaz said. Three spots in her right lung, one in her left. Diaz took oral chemotherapy pills — roughly $1,000 for 15 pills — and was aided financially through a friend with a ministry who “came through” for her. “I took those (pills) in hopes that it would get rid of the cancer,” Diaz said. Diaz also had another concern, one some might not find as important but it acutely important to Diaz. After treatment, one tumor in her lung disappeared. Another showed no signs of change. “One grew larger,” Diaz said. A pulmonologist wanted to perform a wedge resection to excise the tumors. It was successful, then Diaz underwent radiation. That hurt. In December, her surgeon indicated a 70 percent chance of saving her left arm. Two weeks later, the prognosis changed. Amputation was recommended. “I said, ‘well, I need a couple of weeks to digest this,'” Diaz recalled. Yet another step of hope intervened. Diaz’s oncologist told her of another patient with a similar condition on his hand that received treatment at the Memorial Sloan Kettering Cancer Center in New York. Surgery for that patient worked, the doctor said. Last month, Diaz traveled to New York. The last bit of hope was taken away. Quickly. 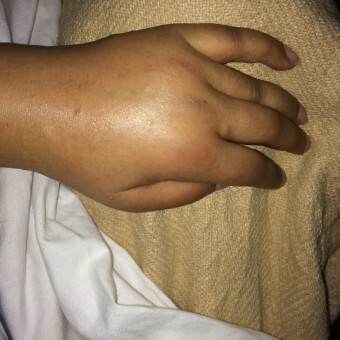 “The doctor said my arm was way too brittle to operate,” Diaz said. She was told rather alarming information. “Your arm could break at any moment,” the doctor said. 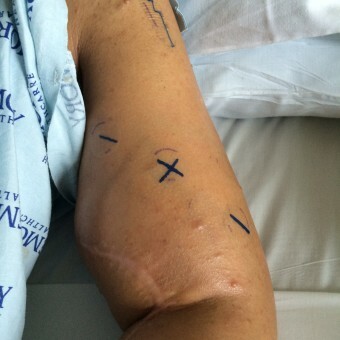 Tracey Diaz is prepped for surgery and her arm is marked. The pain, meanwhile, grew worse. Diaz couldn’t lift her left arm above her chest. She couldn’t wash her hair. And then life intervened. While riding in a car, the vehicle accidentally drove over a curb. While being helped to a dry spot, her arm was pulled. They heard a crack. Diaz started screaming. Surgery had been scheduled for March 30. It was a week early, and Diaz found herself in the hospital’s emergency department. The doctor was surprised by what he saw — two breaks in her arm, and the decision was made to amputate just above the high break. The pain is gone. At least it’s supposed to be. As any combat-wounded military veteran can tell you, phantom pain is real. Add Diaz to the long list of believers. The focus now is on pain management and recovery — and what’s next. Diaz was assigned the same physical therapist who helped a woman suffering from flesh-eating bacteria. The woman had both hands, one full leg and a partial second leg amputated. She said small children are the most frequent spectators. She’s not worried, though. She is, of course, but not to the detriment of her quality of life. That’s due to her faith. “With God, all things are possible,” she said. Diaz left Richmond County in 1983 shortly after graduating high school. She attended UNC-Charlotte for more than two years, then relocated to Myrtle Beach, S.C. From there, she moved to Marietta, Ga., and earned her bachelor’s in business communications from Kennesaw State University. Diaz has homeschooled her children. Matthew is nearly finished high school and Carlos is now a student at Chattahoochee Technical College in Marietta. © 6072 The Pee Dee Post. All rights reserved. XHTML / CSS Valid.